Our guest blogger is actually a Suburban Papa, for a change. 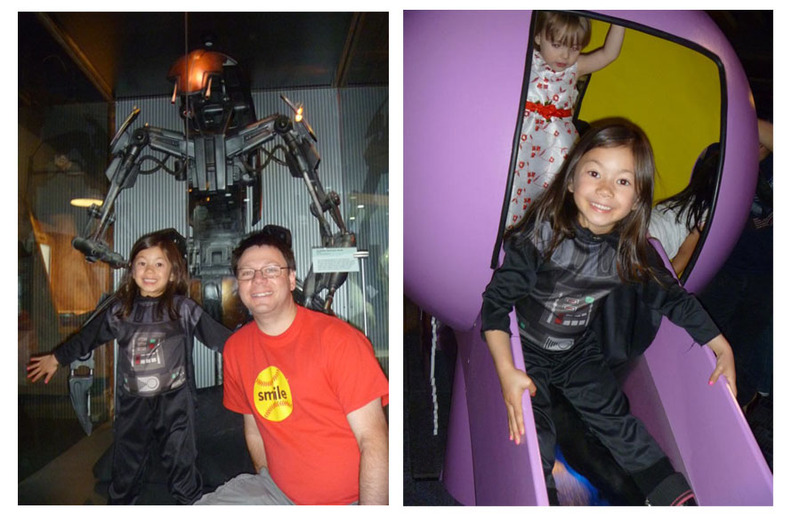 During a recent Star Wars Fan Day at the Discovery Science Center in Santa Ana, Matt Borack took his family to check things out. Here’s his story. “Star Wars is a big part of my life and my kids lives as well. Having the opportunity to relive it up close and share that with my kids was an amazing experience. As we walked into the Discovery Science Center, we immediately saw various Star Wars characters in authentic looking costumes posing for the camera. They were friendly, accommodating and genuinely enjoyed being there. The bulk of the Star Wars collection, the costumes and models, is located in a room to the right (look for a line). It’s easy to not realize its importance and walk right past it, but fortunately for us, my older kid’s curiosity saved the day. In there you can take your time viewing the costumes and models from the various episodes and listen to the audio recordings that provide more details. The models were particularly interesting to me and they included the Millennium Falcon, a Tie Fighter, Imperial Cruiser and a Land Speeder. This special ‘Fan Day’ featured an exciting presentation teaching “Galactic Survival Skills” and on the “Speed of Light.” Guests were encouraged to come in costume. My daughter came as the happiest Darth Vader on the planet. The Star Wars exhibit is just a part of what the Discovery Science Center offers. Keep in mind that the Star Wars exhibit is only here until April 15th.